[pullquote]”It is a positive outcome. We didn’t want to go down to the courts. This was their chance to make amends. We want to draw a final, positive line under it.”[/pullquote]Teenage vandals who rampaged through an infant school have come face to face with the head teacher to apologise for the mindless act. 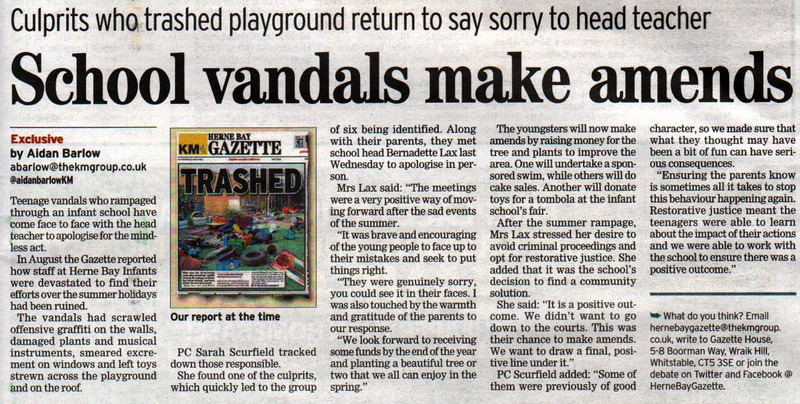 In August the HB Gazette reported how staff at Herne Bay Infants were devastated to find their efforts over the summer holidays had been ruined. The vandals had scrawled offensive graffiti on the walls, damaged plants and musical instruments, smeared excrement on windows and left toys strewn across the playground and on the roof. The youngsters will now make amends by raising money for the tree and plants to improve the area. One will undertake a sponsored swim, while others will do cake sales. Another will donate toys for a tombola at the infant school’s fair. After the summer rampage, Mrs Lax stressed her desire to avoid criminal proceedings and opt for restorative justice. She added that it was the school’s decision to find a community solution.